Three ingredients that many guest love in Ramadan. 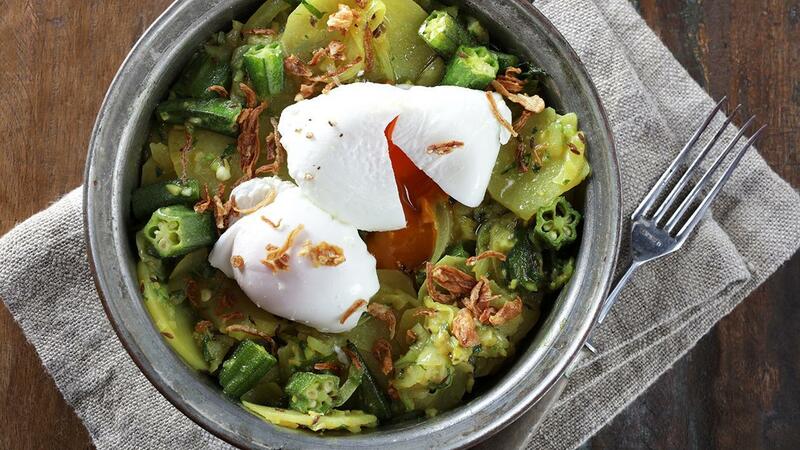 Okra, Potatoes and eggs. We’ve put them all together in one dish. Heat the oil in a skillet large enough to hold 2-4 eggs. If serving 10 you would need two or three of them. Whenhot, add the cumin seeds and let sizzle on medium heatuntil they change colour (watch closely for this). Then addthe butter. Add the green chilli, ginger, and garlic and sauté for 1 to2 minutes, until the garlic becomes pale but does not colour. Add the onion and sauté for 1 to 2 minutes more, until translucent, then add the turmeric, stirring over low heat for another minute. Now add the potato slices and sauté for at least 3 to 4 minutes. Add the okra and a sprinkling of Knorr Chicken Stock Powder and stir together. Pour in a dash of water, cover the pan, and cook over low heat until thepotatoes are just tender, not falling apart (about 4 minutes). Gently stir in the cilantro, then adjust the seasoning as necessary. Scrape down the sides of the pan. Pouch the eggs and place them on top just before serving. Garnish with crispy onions.